We continue sharing interesting speeches from 8P and as you could understand from the title this one is about local SEO in Google. 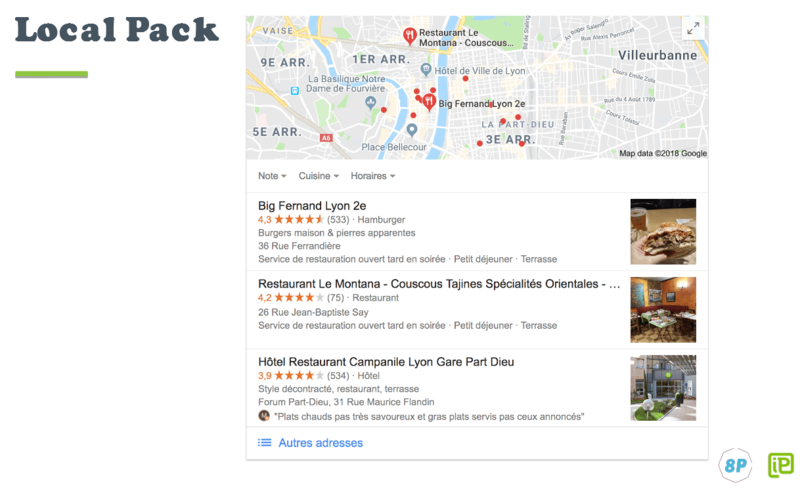 Alexis Rylko, Senior SEO Specialist at iProspect France, shared his own experience in local SEO. What is the Proximity to Google? In local optimization our target audience is searching products and services in the particular location. Geolocation can be tight or broad, it can be the city, district or state. Depending on the country there are different administrative units and geolocation trends. And another point is that geolocation can be explicit and implicit. For example, geolocation can be expressed directly in search query that is pretty clear. Or it can remain in the user's mind, so we type common queries and see the answer to it in local results. Explicit is, for example, 'pizza in Paris', implicit is just 'pizza' and you'll see all the nearest places where you can get pizza. 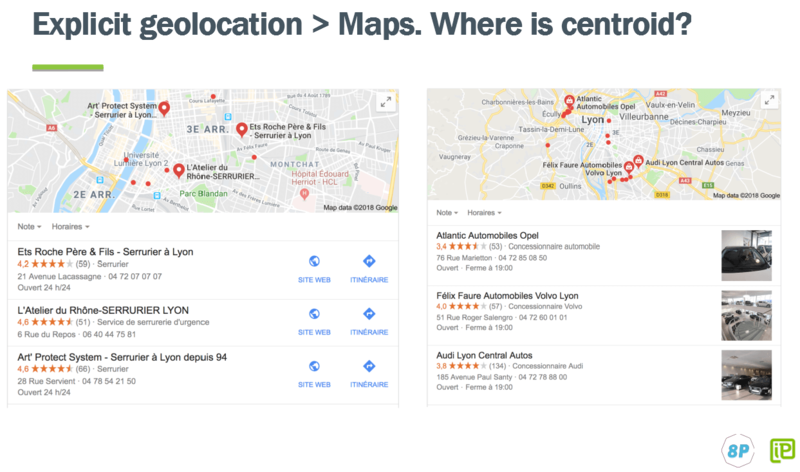 Queries with implicit geolocation can also differ. They have their own classification. It means that they can either depend on business proximity to you, or this correlation can be very little. And, of course, every business and niche has its own peculiarities in SEO. Local SEO influences all types of projects. For example, we find local strategies in SEO campaigns on Ecommerce and newspaper websites. Nevertheless, there are so-called pure local SEO types of projects. The first ones are businesses with services in office, for example, dentists, doctors, etc. And the second ones are those who go to clients, for example, gardeners, plumbers, etc. Attitude to these types of queries will be different along with ranking and proximity factors. 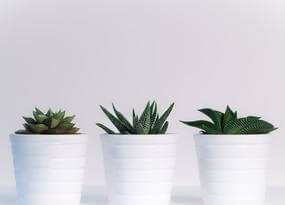 Usually we have three types of results we can rank in. 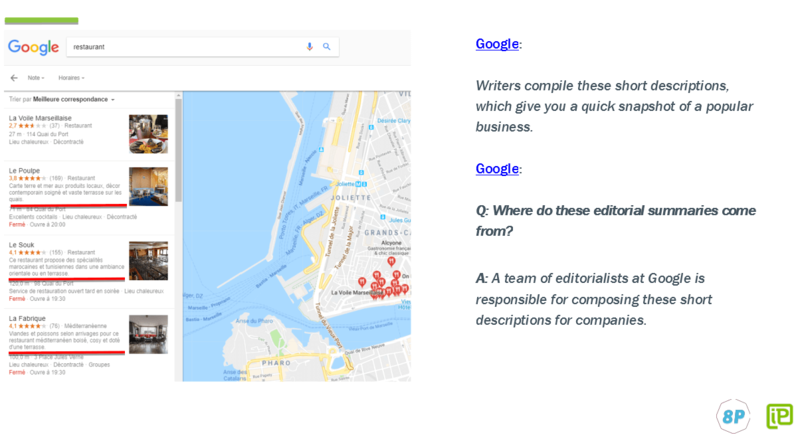 The first one is organic with local results, the second is a Local Pack and the third is a Local Knowledge Graph which can be shown by the company name or common queries where you're the most relevant answer. Search suggestions are also becoming local. As on the example below, if I've typed 'cleaning at home versailles' once, the next queries will have search suggestions in Versailles. So I've been marked. We should remember that not only queries with the city name are in the field of interests of local SEO, but also broad queries without any geographic area. And these queries often are more frequent than queries with the city name. In the example below we can see 'vehicle insurance' search query through three cities in France. We can see that common query 'vehicle insurance' 10 or even 17 times more frequent than the query with the city name. 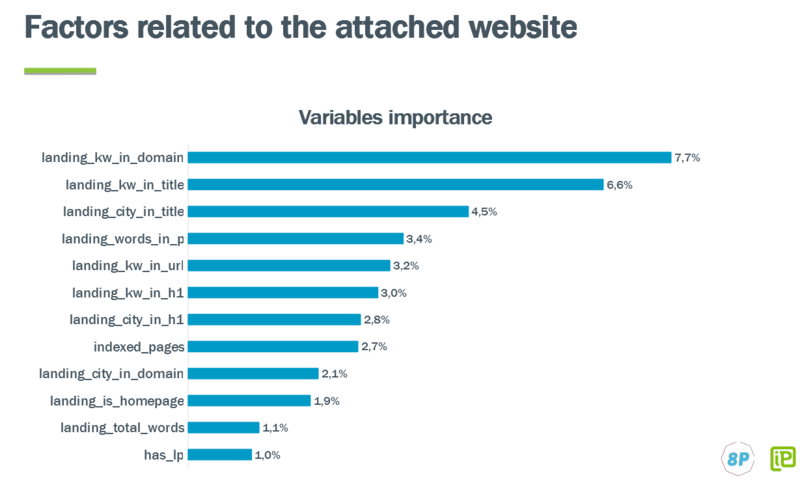 Depending on the topic, the share of localized results may be very different. For example, if we search for 'home cleaning', we have 8 absolutely local results out of 10, they contain the name of the city (Paris). While searching for 'car rental' we have only one local result, and everything else is a bunch of other websites. All these queries were taken for Paris. When we are working with a query with implicit geolocation, for example, pizza, sushi, restaurants, geoposition we ping to the search engines plays a significant role. Now everyone has smartphones and it's very simple to determine. You can check this. If the distance to the nearest places is shown to you in the Local Pack, then your geoposition is defined with a 100% accuracy. And we always have a cross-cutting concept in local SEO. It's a centroid. It has undergone various changes and it has changed in terms of mobile. That is, the centroid is a certain dot around which results are built. In implicit queries we are the centroid and search results are shown according to the proximity to us. Therefore, when we search for a cafe in 6 different dots of the city, we have 6 different search results. 3. What Is the Proximity to Google? 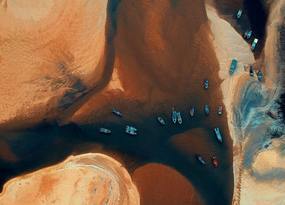 Proximity is a simple straight line drawn from a bird's eye view. That's why sometimes we can notice some strange things. 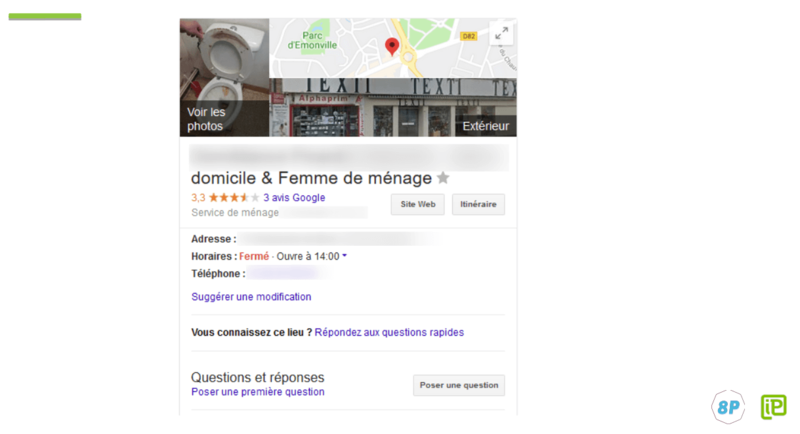 For example, I'm localized here, this is the center of the city of Marseille, and Google offers me one of the first results quite far away (Café des Arts). But according to the straight line it's closer. Depending on the topic we have different correlations between website positions and their proximity to us. And this is actually a feature of local promotion, we can get different data to analyze and it gives us interesting results. This is the correlation coefficient between the position of the website and its proximity to us. We took a large number of queries relating to various niches. 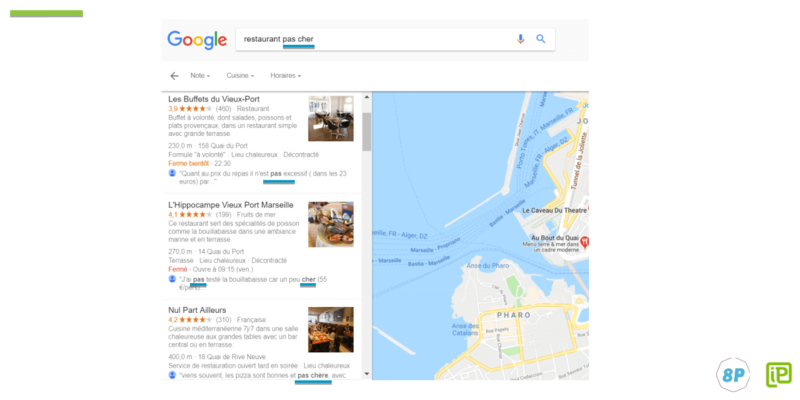 We exported the first 20 results from Google Maps for each query with the proximity (shown by Google) and conducted the same research in 10 French cities. Then we calculated the correlation score between ranking position and proximity (from -1 to 1). We see that the first place is always occupied by food services. 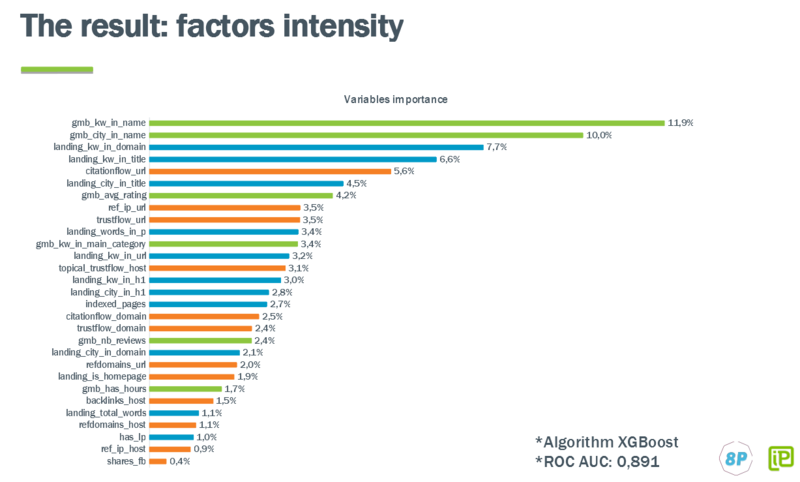 Those who are engaged in analytics and correlations in SEO know that the correlation of 0.9 is almost 100%. It's almost impossible to get this correlation score when we are working with organic ranking factors. At our best, there will be 0.05. And in the local search we can see that there are queries without the name of the city and all the results are lining up for us. 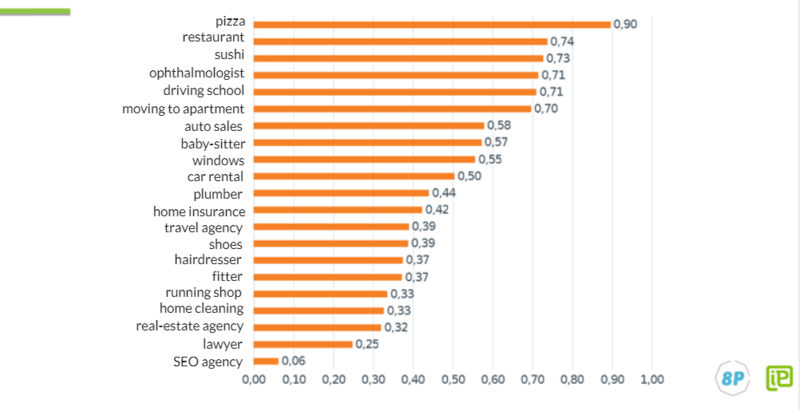 Topics with the most susceptible proximity are food services, pizza, restaurant, sushi, doctors, school, and at the end is the SEO agency. Also, I'd like to recommend a very useful extension for those who work with local SEO. It helps to establish your geolocation very accurately and you can see the proximity at different points on the computer. Simply set the geolocation, set the maximum axis, reboot the Chrome, and now you have a new location. We all saw it, we all know it. Depending on topics, it can differ. We have a Local Pack, which traditionally consists of three results. They are formed from the first three results in Google maps. In recent years, the ranking in Google maps has become closer with the ranking in the main search. And we notice very often that websites ranked in the Local Pack are also present between 10 websites on the 1st page of Google search results. Let's look closer to Local Pack and what it can consist of. The first element is the company name. For a better ranking webmasters can put within some keywords. Typically, Google says that you can't use keywords in your company name. But it doesn't punish for this yet. The second element is the main category which we added to in Google My Business account. I remind you that there can be added to 1 main category and 9 additional ones and it allows you to increase your coverage. We know that we have categories that we can add. 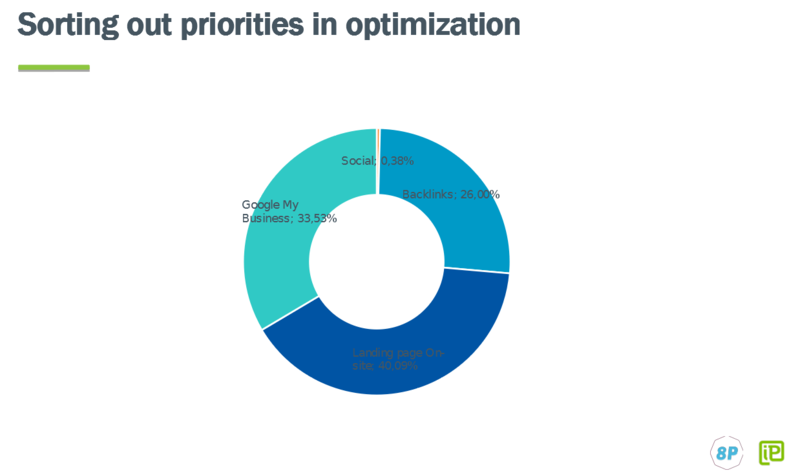 Categories are necessary to us to increase coverage for the necessary keywords. Usually we can see only one category in the Local Pack, more rarely we can see an additional category. So you can find additional categories using your competitors. You can take a page of Google maps and look at the source code. 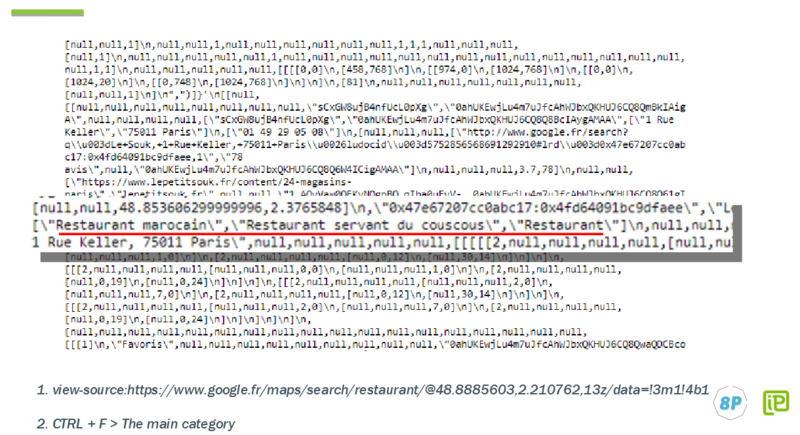 In this example, the main category is 'restaurant', and an additional 'restaurant marocain' and 'restaurant servant du couscous'. We have also reviews that play important role in the ranking, especially in some industries. 3 elements separated by a dot, they are our attributes that can be added also in Google My Business. Editorial summaries are a very interesting things. We have long tried to find out where they come from, because we can see them in different places and restaurants. These descriptions don't correspond to what is in Google My Business. So where do they come from? It turns out that Google has a team that writes these descriptions for popular places. Generally for such well-known places as Dominos, McDonald's, etc. Reviews are also very significant. We have three indicators: the average rating, the number of reviews and the text of the review. When there are tons of reviews, Google makes an excerpt. There were different hypotheses which words it singles out but everything is very simple. Google picks up the most frequent words. It is difficult to work with reviews. Particularly, it's hard to remove a review. 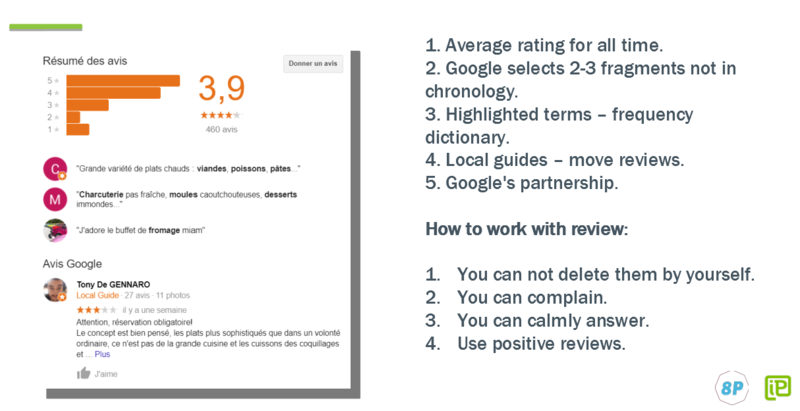 There are some common techniques to work with negative reviews: complain, calmly answer, drown them out with positive comments. Also, reviews are being indexed and participate in the ranking. You can see that when you expand the query. For example, if you search for not just a 'restaurant' but 'cheap restaurant', Google highlights entries with the word 'cheap'. Local Knowledge Graph can be shown by the company name or by general queries in locations where you are the most relevant answer. It's pretty visible in search results, but some interesting situations can occur. For example, our client wrote us and asked to remove such not so pretty picture (you can see it on the screenshot below). They are doing home cleaning and such pic was not very nice. So we created 10 accounts in Google, complained about it and Google removed the photo. 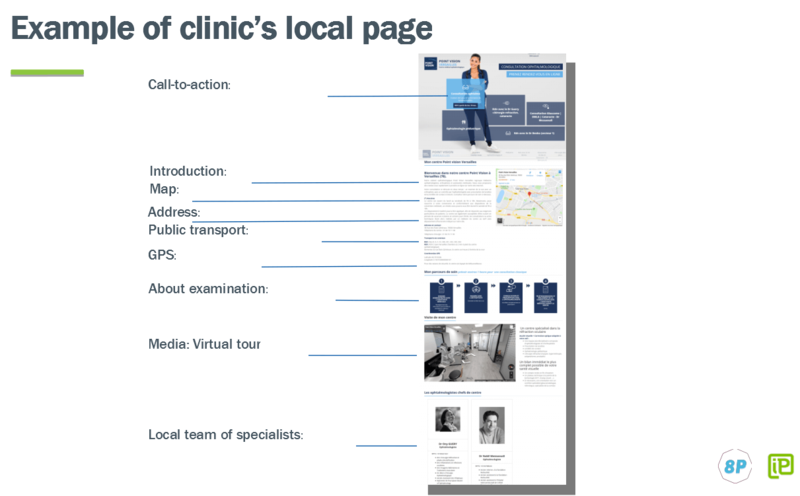 When we want to rank in organic local search we should work with local pages. You can clearly see it if your site is specified for different regions. On the example below, you can see the pages ranked for the broad query 'home cleaning'. 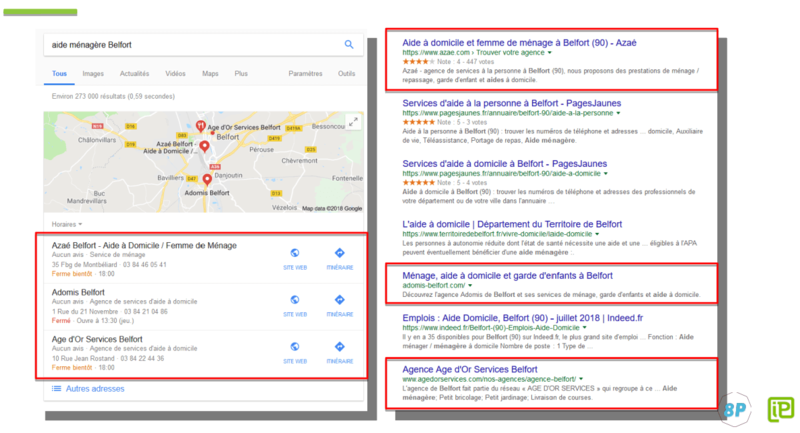 Across different cities in France, it's not our main page about home cleaning services that ranks, but local pages optimized for queries 'home cleaning + city'. You can have different levels of local pages, the detalization depends on search particularities in your industry and country you target. Local pages can be beautiful when local companies place a lot of useful information. But not all local websites look like this. For example, locksmith topic is much more complicated. Where is centroid for general queries? This is the city of Lyon. For example, the city center is located here (look at the screenshot below). We search for a 'locksmith Lyon', and we get results somehow from the side and the nearest results don't participate in the Local Pack. And let's say we have an 'auto dealer' query. The city center is here, and dealers are scattered. Therefore, I think that the concept of the centroid has greatly diminished and other factors have become more important. 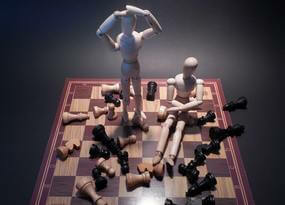 Now, we will try to see how we can discover important ranking factors in a particular niche. I took two topics – locksmiths and plumbers. 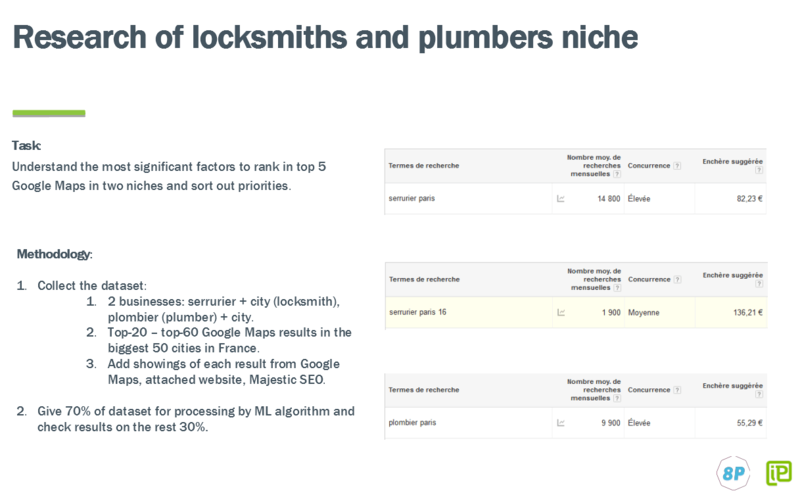 You can see that the cost of a click for the 'locksmith Paris' is €82.23 and the cost for the 'plumber Paris' is €55.29. Quite expensive. We'll take these two queries, take 50 largest French cities, export the data from the maps, everything that they have for these queries. Then we will enrich all exported results with other indicators such as on-site and on-page characteristics, backlinks, etc. 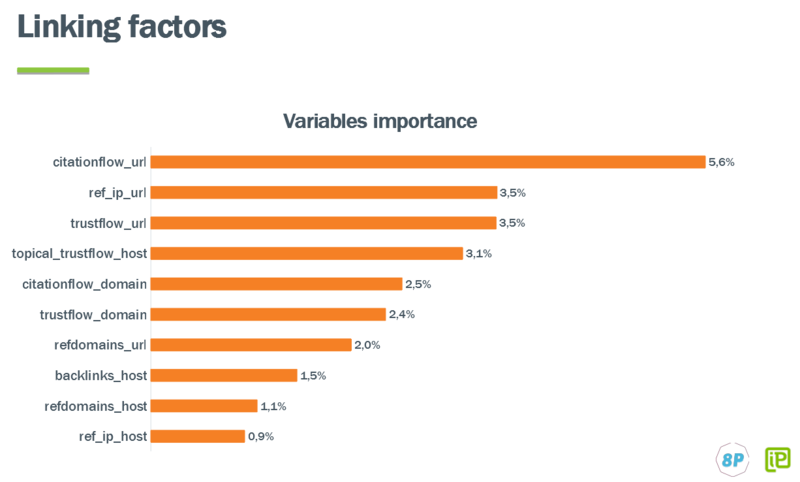 Next, we'll try to predict what factors are the most influential for this topic. Then we use machine learning to process the 70% of our dataset and test its efficiency on 30% of remaining results. 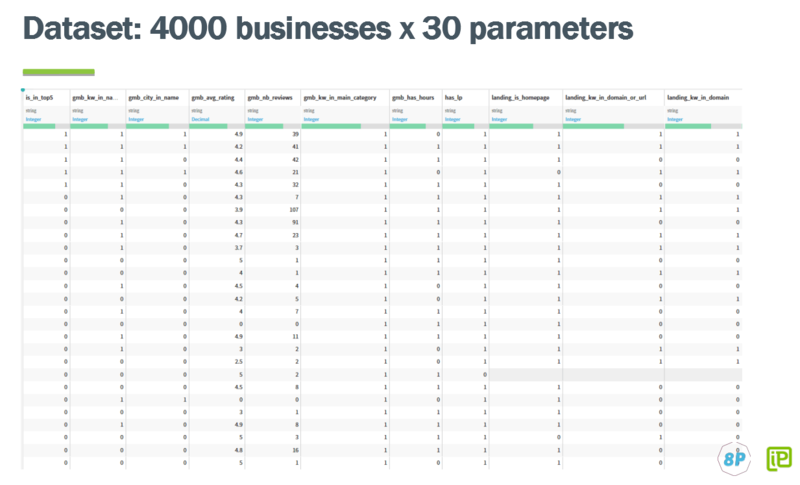 So on the screenshot below you can see what our dataset looks like. 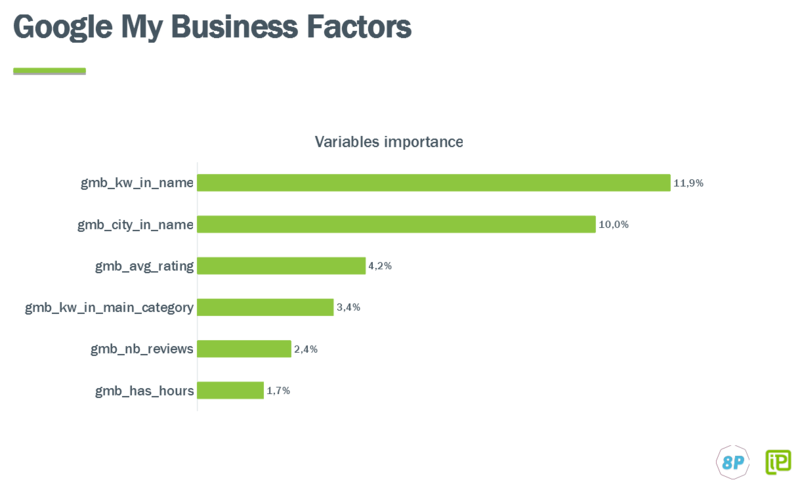 It includes the presence of a keyword in the name of the company, the name of the city, the average rating left by users, the average number of reviews, keywords in the main category, open hours, if landing is a homepage, etc. In the popularity factors, we see that they are no longer promoting the host, but the page they are ranked on. Perhaps it is worth allocating a budget for promotion not for the main but for the local page. As a result we have such diagram with our priorities. So in this post we were talking about explicit and implicit queries in local SEO and their peculiarities. Also, we found out the meaning of proximity to Google, how to discover additional categories and improve your coverage in Local Pack, what it consists of, how editorial summaries appear and how to work with reviews, how to remove the photo from Local Knowledge Graph and the icing on the cake – how Alexis conducted a research of local tops. I hope this report was useful and interesting for you. And how do you analyze local tops?